It's always there. ALWAYS. The heat is bad this time of year, but it's the sunshine and the constant glare that pains me. Phoenix, you see is the second sunniest city in the world. THE WORLD. The sunniest one is just a few hours away in Yuma, Arizona. When most people think of the sun it's like this. 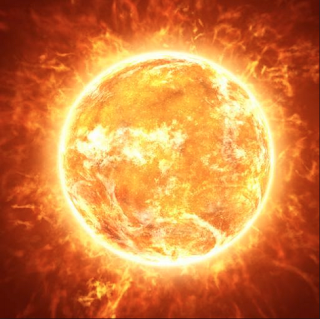 When I think of the sun it's more like this. The glare burns a hole in my head through my eyes as I scramble for my only protection... My $10 sunglasses. The light reflects off everything even the pavement for some reason, and then we hit November and the weather outside is pleasant all at once, but the sun still shines. My eyes hurt from it. My head hurts from it. On the other hand I don't want to live in the cold and the dark. There must be some middle ground. This week Naomi and Phoebe started their new school, up in Glendale. It's called the Arizona Conservatory For Arts and Academics. Naomi has entered the middle school and is starting off with guitar and ballet as her arts choices and Phoebe is studying visual arts and advertising. They attend long days from 7:30am till 4pm, but the school has Fridays off so kids can come in for tutoring or rehearsals for any performance classes. They seem to be adapting well (especially to the 3 day weekend part). The most incredible vegan chocolate cake made by Naomi for Chloe's big day. 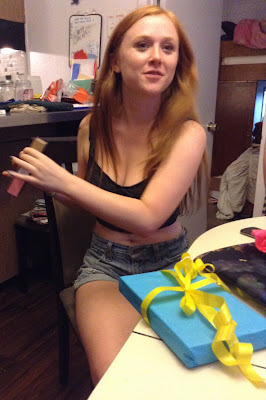 This week Chloe turned 18! On the morning of her birthday I said "Hey now you're 18!" "Yes, now I can uuuuuh..."
"Well you can join the military." "No, Mom, I have a heart murmur." "Right, well, you can register to vote." "I did that months ago...."
"Oh yeah, well, now you can be prosecuted as adult!" "YAY!" (then she rolled her eyes).